SAP is betting on an innovation agenda to sustain its seven consecutive quarters of growth, but with all the attention on cloud, mobile and in-memory computing, is the business software maker in danger of moving too far from its core ERP business? Innovation, was certainly a dominant theme at of SAP’s customer and partner event Sapphire in Madrid, but Jim Hagemann Snabe, co-chief executive at SAP was at pains to emphasise that SAP is innovating at the core as well as in mobile, cloud and in-memory computing. Snabe announced that innovation around the core ERP business suite is ramping up from a six-monthly cycle to once every quarter, saying there is momentum at the core with lots more innovation to come. “SAP believes a company needs to understand and grow from its core, and our core and 39 years’ experience is in the ERP business suite,” he said. Snabe said the core remains important as a base for all the innovation at SAP. “We will not abandon the core; by revitalising the core and ensuring consistency, we are able to innovate faster at the edge with mobile and cloud,” he said. Driving the point home, Snabe said while SAP was innovating at the core as a basis for all other innovation, some competitors were tearing everything down and offering something new. Despite the new emphasis, Sapphire Now was highly focussed on SAP’s innovation in mobility and in-memory computing. There was some talk of cloud, but not much. But SAP’s high-performance analytic appliance (Hana) was the star of the event. Both Snabe and Vishal Sikka, chief technology officer at SAP, devoted the lion’s share of their keynote presentations to Hana. This is not surprising, as initial implementations of Hana boast impressive performance gains, and SAP is clearly betting on in-memory computing being an important new revenue stream. SAP customers, who are paying for innovation to come through enhancement packs, will not be getting the benefits of in-memory computing unless they pay extra for it. SAP's challenge is that it wants to continue growing, but does not have the natural source of growth that many of its competitors have from data inflation, says Duncan Jones, a principal analyst at Forrester Research. “Whereas the likes of IBM and Oracle get extra money when customers add processing power to cope with ever-increasing workloads, SAP does not, and since most of its customers have all the user licenses they need, SAP has to come up with new products to sell, and that means that it has to moved into new areas,” he says. Japanese retailer Yodobashi Camera is currently one of the highest achievers, said Sikka, achieving a 129,000 times improvement. Calculating what rewards the retailer’s five million customer loyalty club members should receive previously took three days using an Oracle database, but 2 seconds with Hana. What makes Hana unique, said Snabe, is the combination of everything running in main memory and the IQ column-based data storage technology acquired from Sybase. He believes this will become the de facto architecture of the future and will impact all categories of business software. SAP’s confidence in Hana is largely based on the fact that most organisations are looking for ways to speed up and optimise existing systems and operations in the current economic climate, and tap vast amounts of data being generated by a rapidly increasing number of sources. Cost savings is another selling point. Snabe says the business case for Hana is easy to understand. Even before organisations look at speed and efficiency benefits, he said, they will see the cost benefit of eliminating the separate database by running the data warehouse in Hana. While SAP hopes Hana will win new customers, it already has up to 14,000 customers with data warehouses based on traditional relational databases. Snabe says for these organisations, Hana will eliminate the cost of using and maintaining traditional infrastructure. “With Hana, all data is in main memory; organisations can browse this in seconds and get answers to any questions without the need to do any of the pre-aggregation of data,” he said. 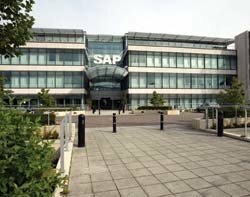 To promote adoption, SAP has introduced a rapid deployment programme, which according to Snabe, means that an organisation could be up and running on Hana within two weeks. While SAP is seeking to capitalise on Hana’s initial successes, the platform is still a work in progress; it is just entering the second of four phases, according to Snabe. In the first phase, SAP did proof-of-concept implementations with around 50 customers to tackle problems typically requiring rapid processing of large amounts of data to solve. The current phase is all about driving adoption of the Hana platform. Next SAP plans to grow the number of applications that make use of the Hana platform. Snabe says they will do this industry by industry, targeting the specific business challenges in each where Hana will make the biggest impact. Finally, SAP plans to integrate Hana into all its products. But is this not an attempt by SAP to build a monopoly on in-memory computing and lock customers in to a proprietary stack? Snabe claims that it is not. SAP believes in giving customers a choice, he says, and will even consider allowing competitors to resell Hana. Hana is clearly a big bet for SAP, but considering the performance gains reported by customers and the widely recognised challenge to business of “big data”, it is a bet that should pay off, especially as Hana is already SAP’s fastest growing category of business. SAP’s wider bet is to ensure that it will continue to be able to deliver business value to its customers, but the company’s leadership appears to have learned from the mistakes of others. Throughout Sapphire, SAP’s leadership has emphasised the software maker’s commitment not only to its ERP core, but also to the principle of openness to enable partners to build on top of its technologies and avoid the trap of attempting to lock in customers. SAP’s critics, however, remain sceptical. “From a customer’s point of view, SAP’s top 4 priorities should be core, core, core and core. It has to fix this aspect before it can earn the right to sell its other stuff,” says Forrester’s Duncan Jones. While agreeing that mobility, cloud and in-memory computing are good priorities, he questions whether SAP can deliver leading solutions. “Even if they do, many customers will prefer to buy from other sources, because SAP is over-charging and under-delivering on maintenance,” he says. SAP could have a huge opportunity for Hana, says Jones, but only if it becomes a better partner to its strategic customers, so they prefer to buy from it rather than IBM or Oracle. SAP should also deliver it, he says, at no extra charge, within existing products to customers on maintenance, so it gains a critical mass installed base who will then want to extend its use to areas outside their existing SAP footprint.